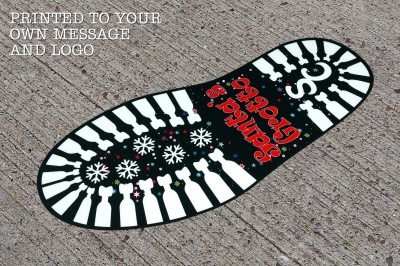 Floor Sticker is printed and cut to Santa's Boot Print Shape. Printed up to Full Colour with your own Message and Logo in the Heel. Floor Graphic is made from White Permanent Vinyl with Clear Non Slip Laminate for Outdoor Use. Minimum Online Order Quantity is 10 Floor Stickers (5 Pairs). Floor Graphic is made from White Permanent Non Slip Vinyl for Long Term Outdoor Use. Minimum Online Order Quantity 5 Pairs.